Elmers Barn01263 715779work01603 870304fax Self-cateringElmers Barn, a conversion retaining original features, is situated in the owner's grounds on the edge of the village of Saxlingham Thorpe in Suffolk. It is an ideal location from which to explore the lovely countryside of East Anglia, the coastline, the cathedral city of Norwich, and the Tas valley with its vineyard and nature reserve. • We regret Elmers Barn is not suitable for babies. 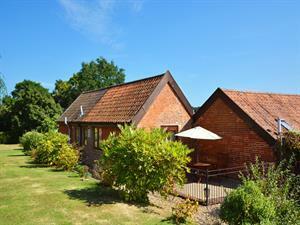 Elmers Barn offers weekly bookings starting on Saturday.